The day hubby and I went down to Detroit, I was pretty sure I would finish the hand stitching I had planned to do and wanted another something in the queue in case I had more time. And I did! I didn’t have much time to think about a project, but I opened one of my cupboards and spied a pile of these vintage blocks. They are round about 17 inches and the background fabric is a rather loose weave. But they are all basted so who am I to argue? 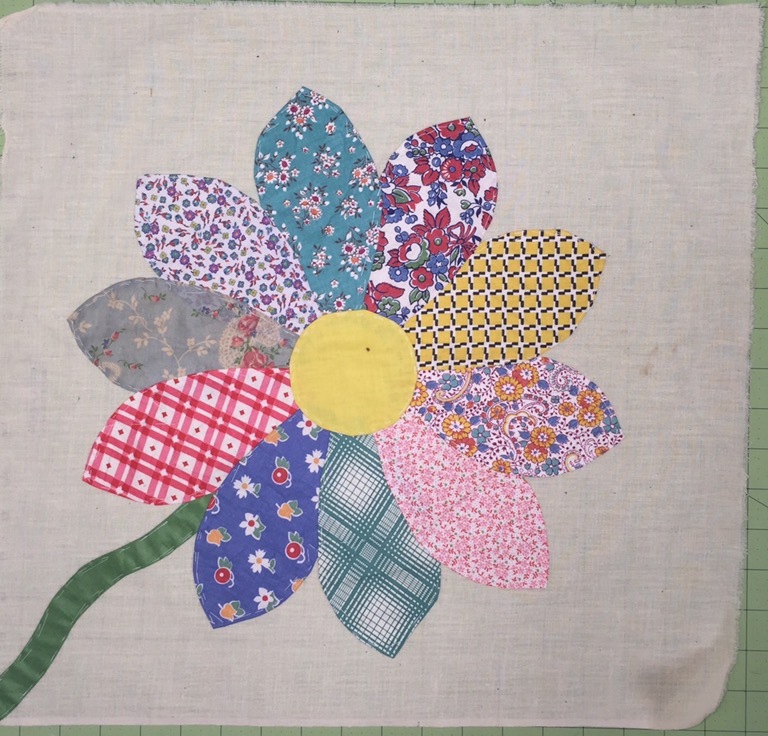 I am going to applique the centers and petals and leave the stems until the end. When I get that far, I will trim all the blocks to the same size and then applique the stems. There are 20 of these blocks. I think they will look great with sashing and corner stones. This will likely be a very long term project, but I will be slow stitching on it today! Hold the presses! I just found this on Pinterest! I love the black stitching! But I’ve never done this kind of stitching. I think pearl cotton would work? Any ideas on needles/thread for this? Thanks in advance for any help! PS There area few days of voting left for Pets on Quilts over at Lilypad quilting. Click here to see all the entries and to vote for your favorite. This entry was posted in Uncategorized, Vintage Fabrics. Bookmark the permalink. I have seen Becky Goldsmith do this type of applique. I think a 12 or 16 perle cotton is what she uses. The bigger needle will make it easier to get thru all those layers. Love the look! A perfect slow stitching project for today, and several Sunday’s to come! 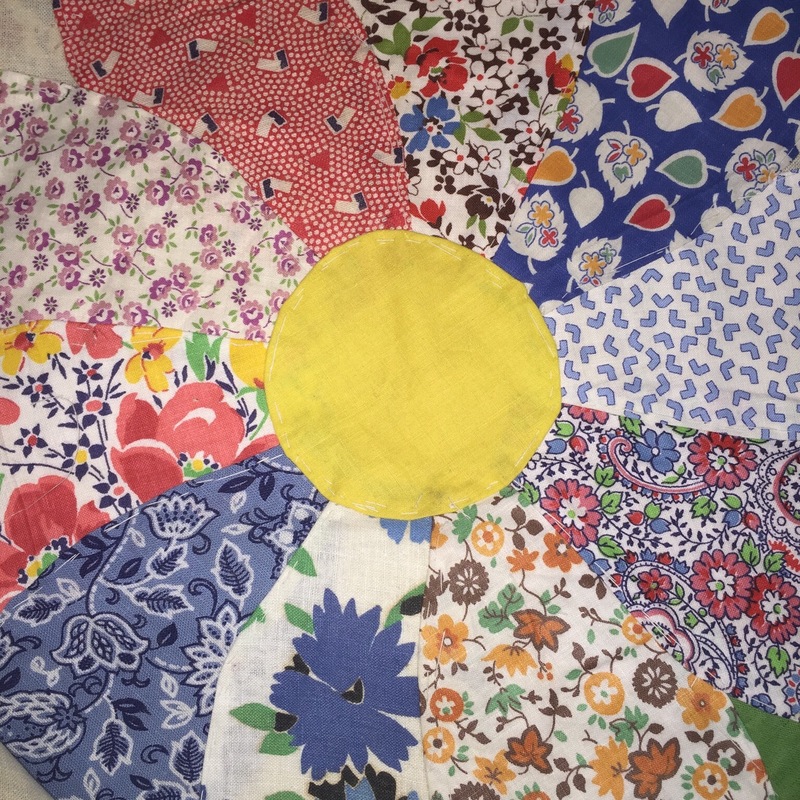 I love your vintage fabrics they are so cheery. I look forward to seeing how these blocks progress. 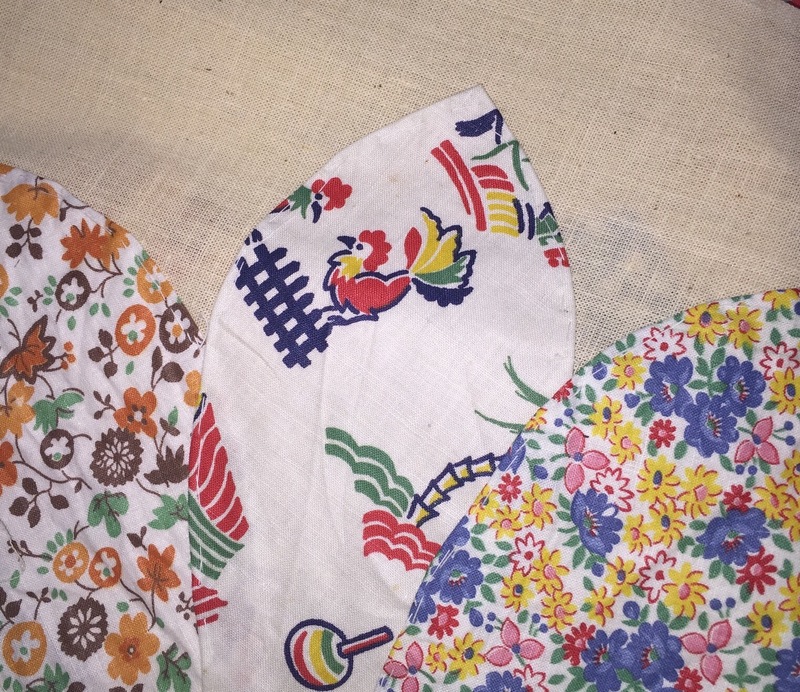 Such great vintage fabrics! Love the idea of the edge stitching with black floss! It’s super crazy that you found an exact twin to yours on Pinterest. How cool is THAT! I see others have suggested pearl cotton. Is that the same thing as embroidery floss (as used in cross stitching)? I can’t wait to see a completed block. Great fabrics! Nice portable project. You might try perle cotton 8 or 12 weight. I think the 3 or 5 might be too heavy, but it depends on the look you’re going for. Have fun! Your blocks remind me of a set very similar that I have. Wonder if I can remember just where they are stashed? I hope the fabrics in mine are as bright as yours. Gorgeous! Imthinkmthe blck stitching will offset them without overpowering them. I can’t wait to see your progress. the fabrics are great. I like to think about the woman who took the time to make it. what was she thinking, feeling, seeing in her life. I’m glad you are rescuing them. 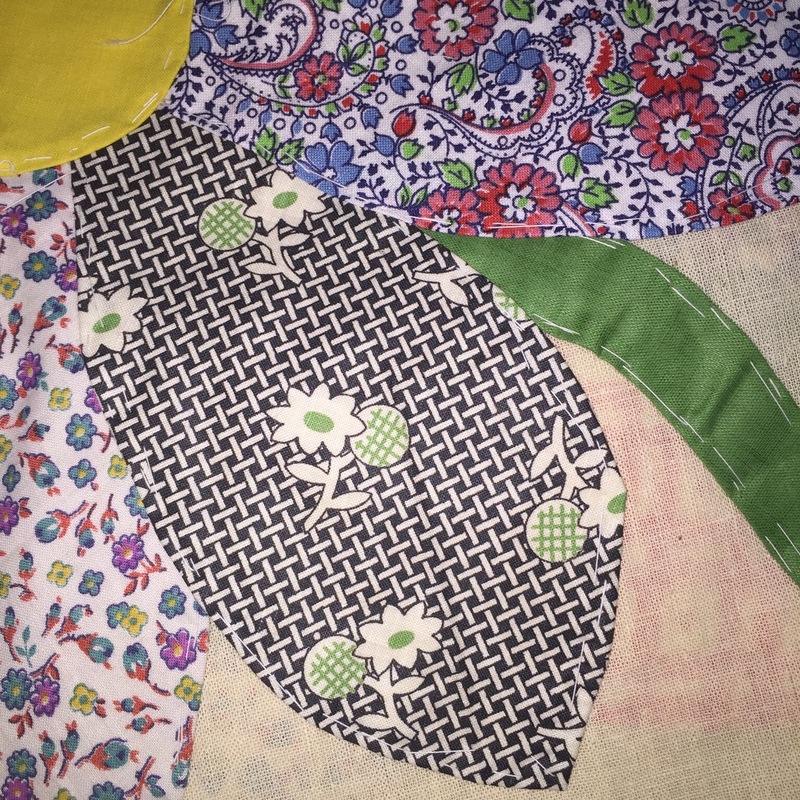 Love these blocks…the fabrics are great!! 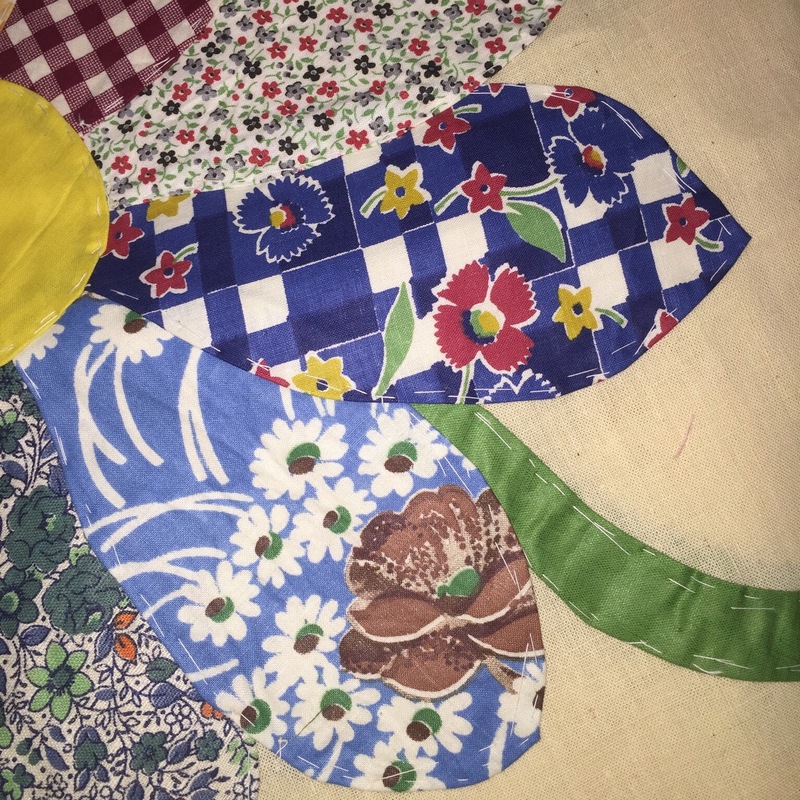 Looking forward to following along on the journey to get these appliquéd and to see how you decide to put them together….great project!! I am working on some appliqué for Slow Stitching today. Your fabrics are fun! I wonder if the black stitching is just decorative and the real applique is invisibly whip stitched. Love those fabrics — especially the rooster one! Happy slow stitching. 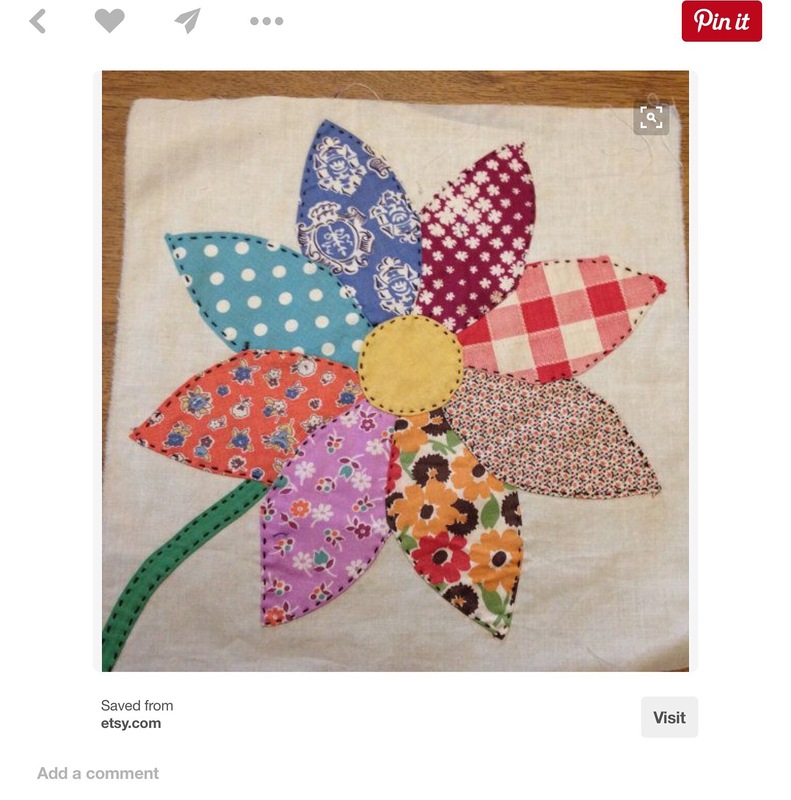 What a cheerful flower to stitch. Enjoy. I think pearl cotton is a very good idea ! Your blocks are very cute and so fresh ! Love all of these fabrics ! I think they are from 30’s no ?